A MASSIVE 84 per cent of all municipal bus sales globally will be electric by 2030, with China leading the market “in spectacular style” by accounting for 99 per cent of the world total in 2017, according to the latest Bloomberg New Energy Finance (BNEF) Electric Vehicle Outlook 2018. 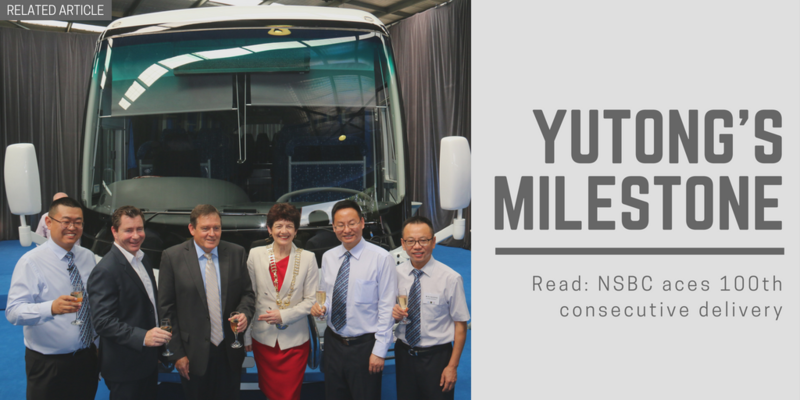 Chinese-manufactured buses: leading the way in electric technology. According to the insightful research organisation and investment-guidance industry entity, the rest of the world will follow and, "by 2040 we expect 80 per cent of the global municipal bus fleet to be electric." It adds that by 2040 it expects about 2.3 million e-buses on the road globally and that they will: "…add to oil displacement and battery demand impacts over the next five years, but are dwarfed by light-duty EV sales once that market gets going from the mid-2020s onwards." Notably, the report drew interesting comparisons and estimations on the current electric (e-bus) use and fleet implementation. It says the Total Cost of Ownership (TCO) of all electric bus configurations they modelled improves significantly in relation to diesel buses as the number of kilometres travelled annually increases. "For example, a 110kWh battery e-bus coupled with the most expensive wireless charging reaches TCO parity with diesel bus at around 60,000km travelled per year (37,000 miles)." "This means that a bus with the smallest battery, even when coupled with the most expensive charging option, would be cheaper to run in a medium-sized city, where buses travel on average 170km/day (106 miles)." However, it continues by stating that despite the potential operational savings [of e-buses] there are still some challenges for electric buses, with their high upfront cost compared with equivalent diesel buses being one of the biggest obstacles. "To tackle this, new business models are emerging involving battery leasing, joint procurement and bus sharing." It further underwrites its merits saying that electric buses are one of the most promising ways of reducing harmful emissions and improving overall air quality in cities. "There are already well over 300,000 e-buses on the road globally, with the vast majority of them in China." It’s probably a surprise to only a few – or those living with their heads in brown paper bags and then stuck under a rock anyway – that, "China will lead the transition from internal combustion engines to electric cars, with EV sales accounting for almost 50 per cent of the global market from now until 2025 and 39 per cent in 2030," it’s stated. Battery technology, advancement and manufacturing underpins the whole shebang, with massive interest in raw materials production, costs and investment potential, with any growth of EVs requiring a, "dramatic scale-up in the lithium-ion battery supply chain." "Lithium-ion battery manufacturing capacity today is around 131GWh per year. Based on plants announced and under construction, this is set to jump to over 400GWh by 2021, with 73 per cent of the global capacity concentrated in China." "Further investments will still be needed; by 2030 we expect global EV lithium-ion battery demand to be over 1,500GWh. All of this is driving up demand – and price – for key battery materials like cobalt, lithium and nickel." "Demand for the components that make up lithium-ion batteries (electrodes, electrolytes) will also increase, from almost 0.7 million metric tons in 2018 to over 10 million metric tons in 2030." Speaking exclusively to Australasian Bus & Coach (ABC) magazine recently, a leading visiting Chinese bus industry spokesperson who requested to remain anonymous went some way to confirm the reasons behind the type of electric bus trends predicted on a global scale, as per the recent BNEF document. As they explained, "The weak side for China is actually our engines. We [China] have Dongfeng, we have Yuchai, but the engine is not as good as Merc or Cummins. So that’s why actually China decided to go full electric – because you do not need an engine, you do not need transmission, so everything is electronic. And now China is the world-leading country for the electric bus. You go to any city in China now, even a small city, all the city buses are full electric. Can you imagine that? In Australia you can’t see it." "It’s been like this for four to five years. We have 1.3 billion people living in China, so there are how many bus[es] sold every year in China?" they asked rhetorically. "So what the Chinese Government is trying to do is taking the opportunity by developing this new technology bus, full electric, so now we do not reply on the European supplier. 'We do not need your engine, we don’t need your transmission, we have a really good axle, really good body, really good chassis, really good motor, good battery'. We put all this together and then we sell it." "We believe that with the full electric [bus], the Chinese brand will take over [sales] of the European brand. They [some European bus brands] have already been running cell buses for more than 100 years. Chinese electric buses only started being made around 1990. So they have this old engine technology they won’t give to China, and for us how we [circumvent] that is we use full electric. We don’t use an engine, we don’t need it. And all this technology is controlled by Chinese [companies]. "The public transport in China is really well developed. At the Melbourne UITP World Bus Organisation training they talked about if they had a city with certain [transport] problems, how do we solve it? Well, these sorts of things have already been solved by the Chinese because we already did it. Lots of suggestions that were given out were already done by the Chinese Government – how to reduce air pollution, how people can better take public transport, scanning to rent a push bike ("In China you don’t carry your wallet") – all these things we already did in China for many years. And in Australia you are just starting to talk about it."